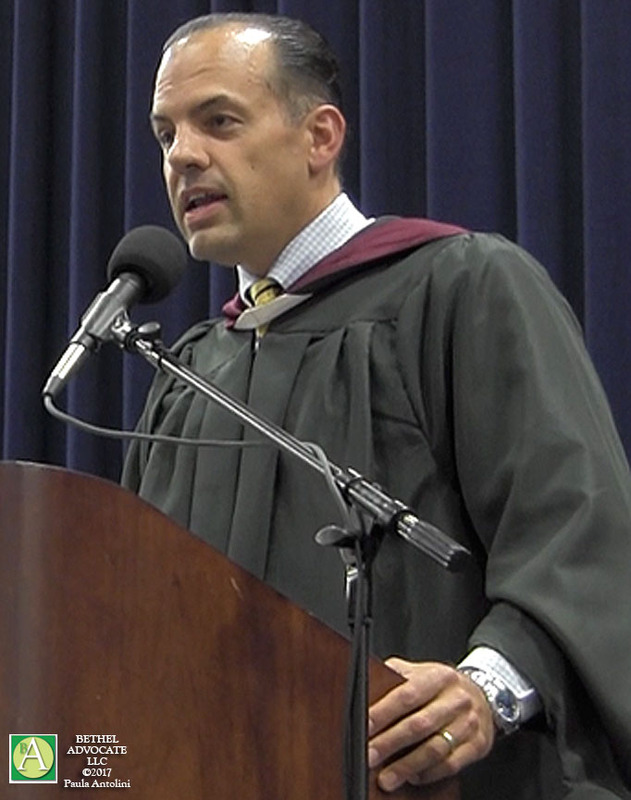 Photo: Todd Ingersoll at the 2017 Bethel High School Commencement where he announced the surprise essay contest to win a car, and also scholarships, and a grant to teachers to help set up 2017-2018 classrooms. Todd Ingersoll of Ingersoll Auto of Danbury presented check for $5,000 to Bethel High School (BHS), keeping his promise made in his 2017 BHS Commencement speech, offering a grant to teachers to help purchase supplies for their classrooms for the 2017-2018 year. Principal Christopher Troetti accepted the check from Todd Ingersoll and will administer the funds to the teachers. Another wonderful, generous offering from Ingersoll Auto! “We are sure they’ll come up with many fun and creative ways to welcome this year’s incoming students to another year of learning and success!” Ingersoll stated on their Facebook page. This comes on the heels of Todd Ingersoll also giving away three cars on July 7, 2017, to 2017 graduating students who wrote winning essays as to why they deserved the car, a contest that was also a surprise announcement at the Commencement. Originally it was supposed to be one car prize but he and his team felt three should be offered when they read the essays. He also announced he’d be offering scholarships and a grant to teachers to help set up their 2017-2018 classrooms. 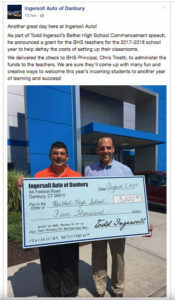 Ingersoll drove to various locations in Bethel, CT, with his team following in a procession, to surprise the winners of his essay contest with a presentation of cars, on July 7, 2017, between 12:30 p.m. and 1:00p.m, and it was captured Livestream on Facebook. Facebook Photo: Ingersoll Auto of Danbury. Bethel High School Principal Christopher Troetti (left) accepted the check from Todd Ingersoll (right).